I create site specific pebble mosaics and I am open to collaborate with designers to produce architectural accents made from pebbles. My public works can be seen in various parks, schools, arts centres, community centres and memorial sites around New Zealand. A pebble mosaic of 3x1.5m installed at Eco Zip Adventures on Waiheke Island near Auckland. 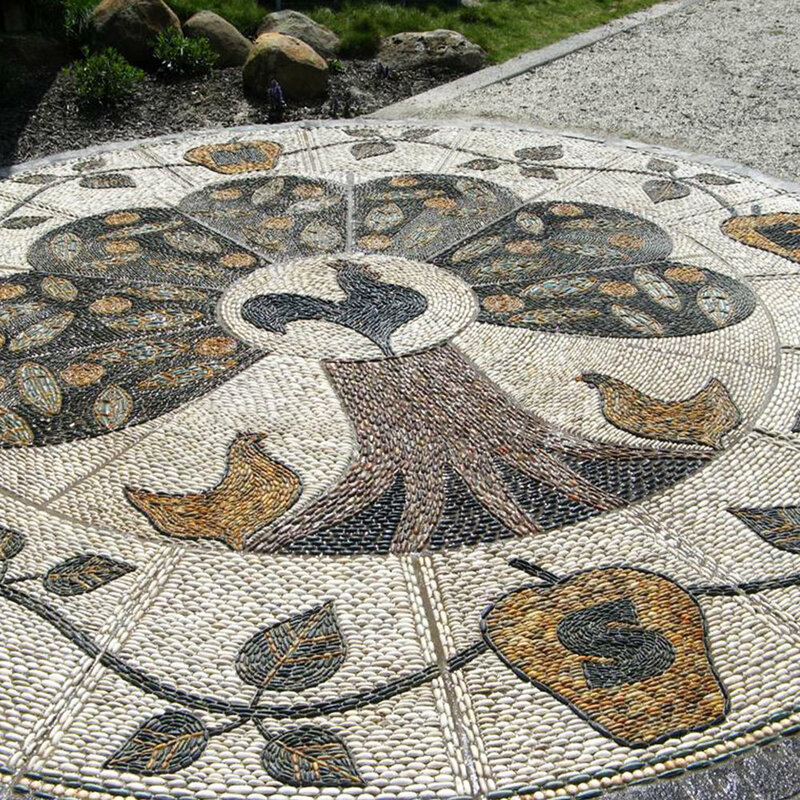 A pebble mosaic of 3x2m installed at Potter’s Children Garden at Parana Park in Hamilton, New Zealand. Two 7m long pebbles mosaics installed at Global Cafe, Zeal Youth Arts Centre in Henderson, Auckland. A pebble mosaic of 3m in diameter installed at Western Park in Ponsonby, Auckland. Five pebble mosaics of 1.6m in diameter installed at the Bastion Point entry on Tamaki Drive in Mission Bay, Auckland. A pebble mosaic of 2.4m in diameter installed at Mangere Arts Centre in Mangere, Auckland. A pebble mosaic of 2.4 m in diameter installed at Wilson School for disabled in Takapuna, Auckland. A pebble mosaic of 4.2m in diameter installed in the children’s playground of Wainoni Park in Greenhithe, Auckland. Two pebbles mosaics installed at the Blennz Homai Campus for the Blind in Homai, Auckland. A pebble mosaic of 2m in diameter installed at the Potter’s Children Garden at Auckland Botanical Gardens. A pebble mosaic of 2m in diameter installed in the children’s playground of Central Park in Papakura, Auckland. 47 m of pebble mosaic rills installed at the Waitakere City Council Building in Henderson, Auckland.